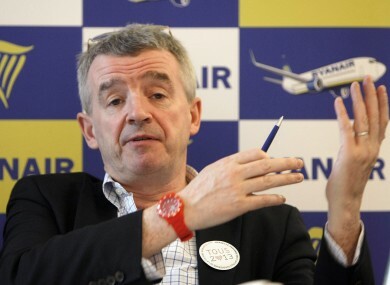 RECKON YOU’VE GOT the skills to impress Michael O’Leary? It’s digital and IT talent the Ryanair boss will be on the lookout for, as the airline begins a recruitment campaign for 50 ‘web stars’. The carrier’s planning to create fifty high-end jobs at its offices in Swords, north Dublin — and the boss himself will be hosting an open day for interested candidates on Saturday week. Ryanair is recruiting web developers, designers, analysts, software engineers, SEO and content, CRM and email specialists to transform Europe’s largest travel website (Ryanair.com), develop a world leading digital marketing platform (in April) and help create a brilliant new mobile app (from June). O’Leary will be joined by the company’s IT and web development managers for the open day at Ryanair’s offices in Airside on 8 February. Interested candidates should register on the Ryanair.com website and those selected to attend will enjoy a free breakfast and free flights to a destination of their choice. You can find more details at www.ryanair.com/openday — and registration closes at 6pm on Monday next. Email “Think you'd pass O'Leary's first round auditions? Ryanair's looking to hire 50 'web stars'”. Feedback on “Think you'd pass O'Leary's first round auditions? Ryanair's looking to hire 50 'web stars'”.